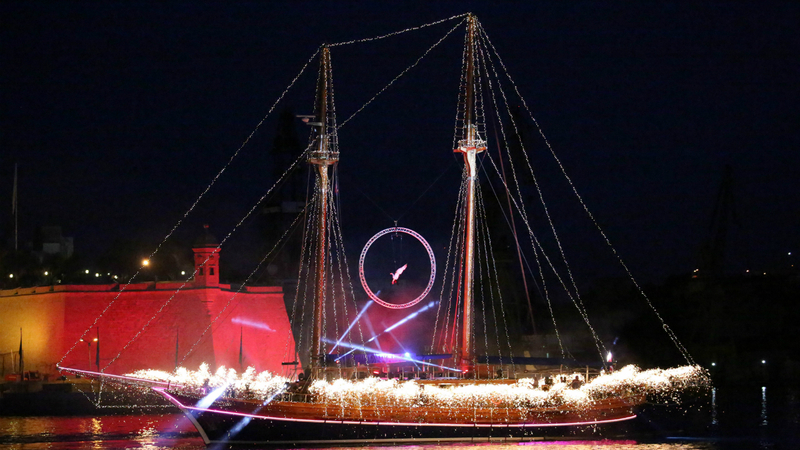 Valletta Pageant of the Seas, is Malta’s largest spectacle of the year, and part of the trailblazing for Valletta 2018 festivities to mark the 450th anniversary since Valletta’s foundation. Stephen Page (DBN), lighting; Richard Babington, pyrotechnics; aerialist Fran Widdowson and rigger Joe White joined Production Manager Sammi Gabb and John Wassell Walk the Plank co-founder, to bring a wealth of experience from major events such as the Liverpool ’08 European Capital of Culture and The Return of Colmcille - Derry-Londonderry UK City of Culture 2013. "The success we achieved this last 7th of June was the result of a tremendous effort by a team of individuals who gave their best for the sake of our country, our people and our collective affirmation of our cherished statehood. We stand before the world as equal citizens, proud of our heritage but with an avid and passionate eye on what is to come. You were an integral part of the team and our success would not have been possible without your kind, professional and stalwart participation."